The crisis of the Five of Wands is overcome, the lesson was learned and has turned turned into a victory. In the middle of the Tree of Life, right in the beauty and harmony of Tiphareth, the flames of the fire appear like pure floating gold. 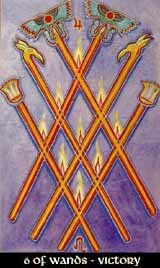 The Six of Wands shows that all the past troubles and disruptions have been necessary to grow and develop, and the victory we have now is more than just a gain by lucky chance. We have deserved it.